← Jadeveon Clowney is George Clooney and Vice Versa. Wait, What? 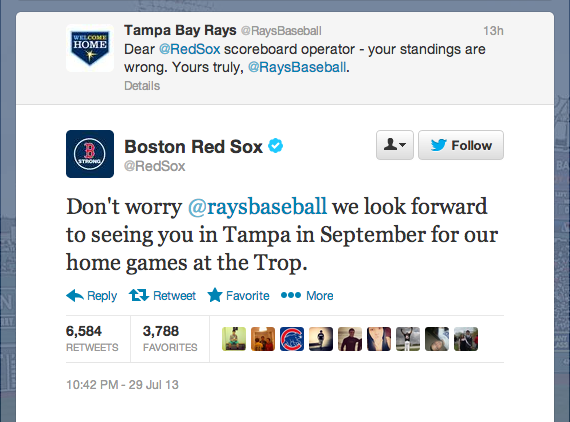 I love when teams try to get cute on twitter… a friendly little jab here and there. I think it’s fun for the fans. Teams just need to know that when they go down that road… be prepared to get trucked… because that’s exactly what the Sox did to the Rays here. Unless, of course, Sox fans don’t even show up in September and they get swept, then the Rays win. This entry was posted in Baseball, Media, MLB and tagged Rays, rays red sox, Red Sox, twitter battle rays red sox. Bookmark the permalink.